The 8th Grade Division at the Basketball Spotlight MDC was packed with talent. Here’s Part 2 of our top performers from the weekend. Charles Pride Guard (Gym Rats)-The defense knows the Pride is wired to score but they still can’t slow him down. The two-guard started the weekend off by blistering Mass Shooting Stars for 25 points, 28 markers against Jersey Shore Warriors and 20 points in their Sunday showdown with New Heights. He used this season to show that he could get it done whenever he steps on the floor. Simply put he gets buckets. 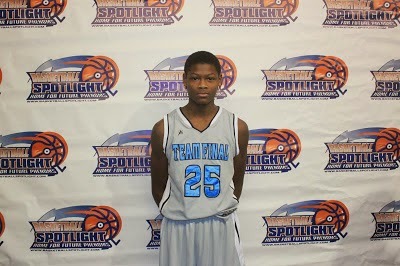 Cameron Reddish Guard (Team Final)- “The Prince” showed his smoothness but also played with a since of urgency when needed. He had the trey ball falling and finished with style against Joey’s Angels and CBC’s. He had a nose injury but still returned to take Team 12 into overtime before falling short against the Brooklyn boys. Mika Adams Woods Guard (Gym Rats)- The slick point guard helped out Pride in the scoring column while also running the team. There are not many that push the rock as quick as this kid. He lit up Jersey Shore Warriors for 19 markers and also had a good outing with in his match-up against Watson and company when he left with 19 points in the loss. Daquan Campbell Forward (New Heights)- Campbell is a monster on the glass and has enough touch to get things done in the paint. He doesn’t mind grinding to get the job done. He hit up Mass Shooting Stars for 22 points in his teams win. Bernard Lightsey Guard (Philly Triple Threat)- I saw Bernard light it up at the Mid Atlantic Regionals and this weekend he showed it wasn’t a fluke. He had the stroke going when he dropped 24 points on Team 85 and another 20 in their loss to the Rens. Lightsey is ready to score when he gets out of bed. Marcus Littles Forward (Team Final)- The more I see Marcus, the more I know the opposing teams will have their hands full with this kid. He continues to get better and even shows a motor which rare for a kid that combines this size with such a young age. I loved his willingness to rebound and be involved in plays. Attention Team Final, build a wall around this kid because he’s a commodity. Paul Durkee Guard (Mass Shooting Stars)- I like watching Durkee when he’s cooking because you can see the long term potential in his game. He runs through the offense well and can knock down the shot when the ball is swung his way. His best showing came against New Heights when he hit two treys on his way to 20 points.